I’ve spent my life seeking to interpret the fleeting beauty and bounty of the world around us. I grew up in the Midwest with a curious and adventurous heart, endlessly digging in the dirt, gardening and hunting/camping with my father. After studying fine art and beginning my career as an artist, I soon realized my life’s passion was to cultivate the ways in which art and nature nourish and uplift the human body and spirit. Sweet Thorn Flora designs floral expressions for the moments we long to hold on to, feelings we wish to linger on our minds and in our hearts. Our creations unite varied textures, colors and shapes that interplay deep and bright, soft and sharp to create a lasting impression. How was she introduced to floral design? Why florals are an important aspect of your wedding? How the arrangements last longer than the initial event that they were designed for? Where can couples find good DIY inspiration? 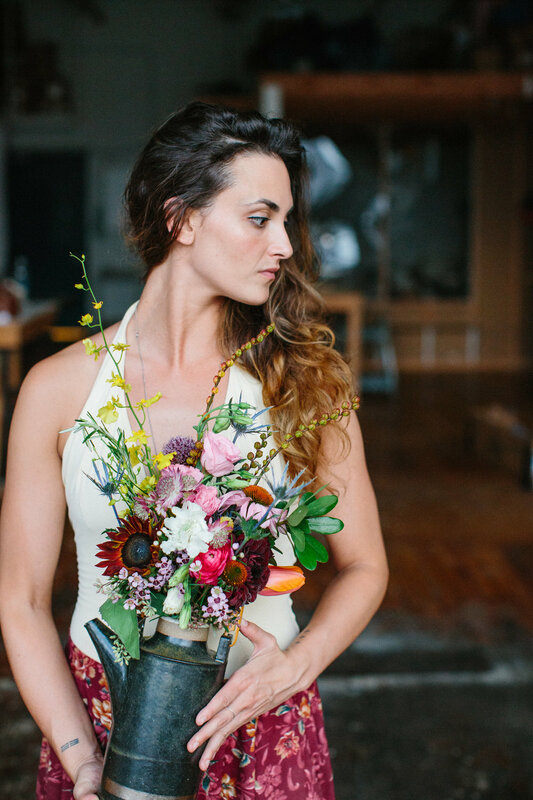 How far out should couples contact their florist? What the booking process looks like? What couples should expect on the day of the wedding?